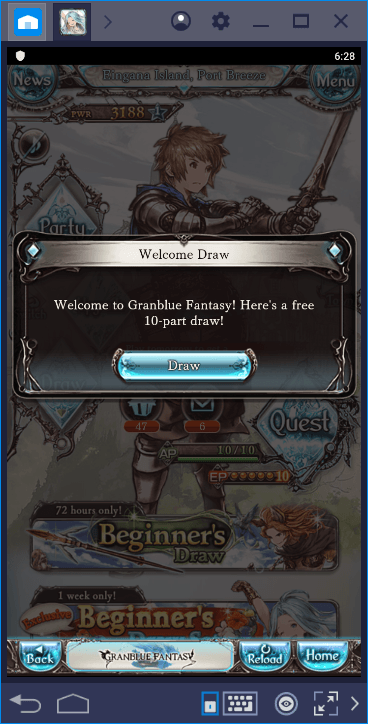 Granblue Fantasy is one of the most popular Japanese gacha games around and as always, BlueStacks is the best platform to play it. In addition to ease of gameplay, you get exclusive tools such as Combo Key and Multi İnstance, which will give you lots of benefits – more info about this below. 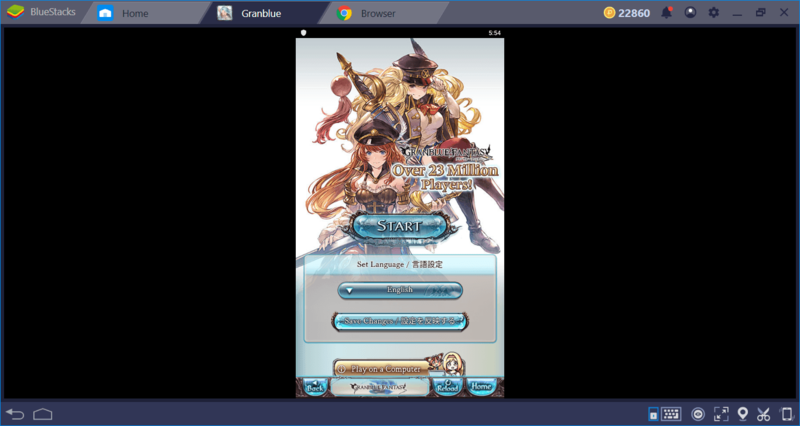 Let’s see how can we install and configure Granblue Fantasy on BlueStacks and start our journey, shall we? As always, we start by searching the name of the game on BlueStacks App Center. However, as mentioned above, this is a “Japanese” game, and it may not be displayed among the search results if you don’t live in a supported country. 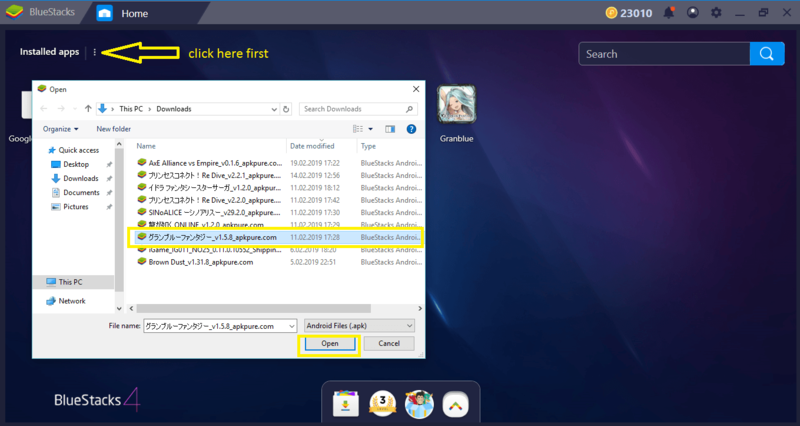 If this is the case, you can download the APK file of the game and use the “install APK” feature of BlueStacks. We cannot tell you where to find the APK file but a simple internet search will be enough to find it. Once you click the “open” button, the installation will be completed in a couple of seconds. Click the icon of the game to start playing. After the first launch, Granblue Fantasy will download an additional 3.80 GB of data. When the game starts for the first time, don’t forget to pick “English” from this drop-down menu. At the moment, Granblue Fantasy supports only Chinese and English. If you want to play the game in another language, you can use the real-time instant translation feature of BlueStacks. 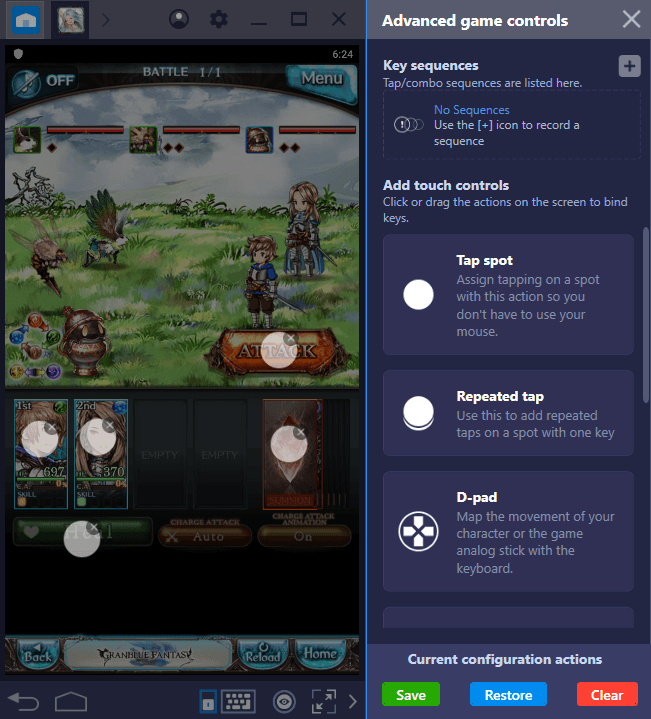 Granblue Fantasy does not support keyboard keys by default. This is not necessary anyway, you can play the whole game with only using your mouse. This is a 2D game that does not include complex controls, every function can be activated with mouse clicks. However, you can still assign keys to these functions, if needed. To do that, you can use our advanced keymap tool. Click the tiny keyboard symbol at the bottom right and open the tool menu. From here, you can drag and drop “tap spots” on top of the buttons and create a control scheme that involves keyboard keys. Assign a key to each of these top spots – in the future, you can activate the desired function by pressing that key. You can also keep using your mouse, of course. 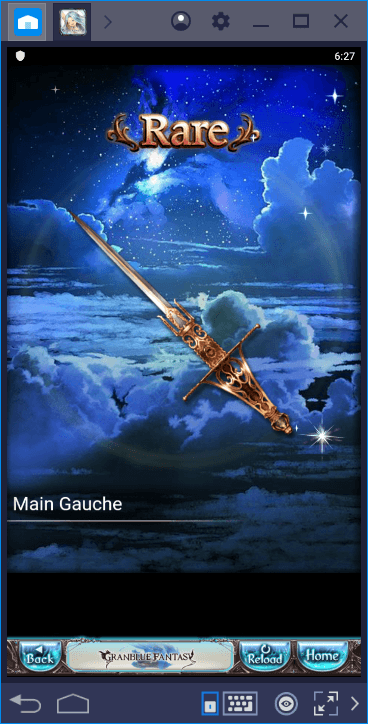 Like many other gacha games, Granblue Fantasy also offers a free summoning at the beginning. This is the basis of gacha games: You make summons and try to collect all characters. The results are completely random, so you can start the game with the most powerful characters or the weakest ones. 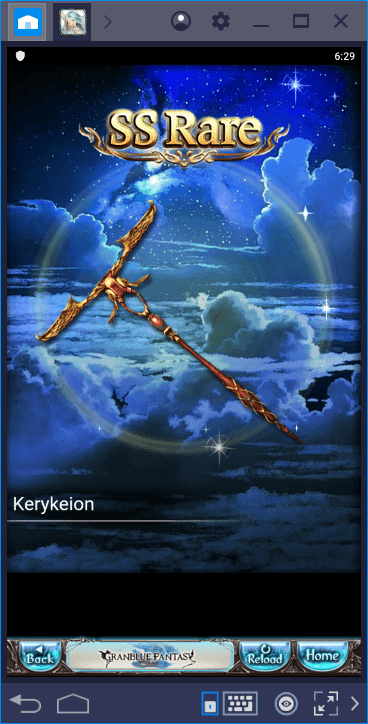 Don’t worry though: Multi Instance feature of BlueStacks lets you repeat this first free summon as many times as necessary – you can keep trying your luck until you get the best characters. We start with creating another instance – each one represents a different game; it is like using dozens of mobile phones at the same time to play the same game. 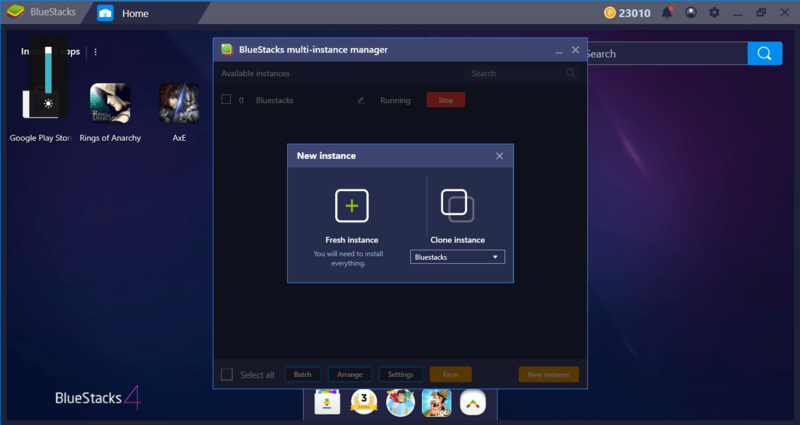 With BlueStacks, you don’t need to do that: Keep creating instances as long as your PC resources can keep up. The free summon screen we mentioned above. Play the game on each instance until you reach this screen – it will take 10 minutes’ top. The results don’t seem satisfying, let’s switch to another instance and make another summon. Voila! We find a rare weapon (or character – will be explained in our review) so we can continue playing on this instance. This is not the only benefit of using BlueStacks: With the help of our Combo Key feature, you can automatize many things in the game and play more efficiently. We will mention these benefits by giving practical examples in our Tips and Tricks guide, so we recommend taking a look at it. Now, you are ready to play: Read our Granblue Fantasy review to understand what you need to do in this huge fantasy world. See you at the game!